In Heather Gudenkauf's second novel, These Things Hidden, we meet four women whose lives are intrinsically connected by the presence of a five year old boy, Joshua. The story is told from the perspective of all four women, which makes for a layered plot and lends to the mystery and suspense of the book - as a reader knowing what another character doesn't etc. Opening the book is Allison, a young woman convicted of an heinous crime in her late teens, now fresh out of prison and wanting nothing more than to start over. In order to escape the town she grew up in, the town where she is known for her crime, she has to live out six months there whilst committing to her release terms. With taunts from the fellow convicts in her residence of half way house, and her family not wanting anything to do with her, Allison wants nothing more than to just leave, but with a job at a local bookstore available there's hope to hold on to. Brynn, Allison's younger sister, is a college student living with her grandmother after the aftermath of her sister's crime was too much to live with in a small town community. Wanting to escape that fateful night, Brynn seeks solace in building a new life for herself, working with animals, and medication to beat her demons. Brynn also wants nothing to do with her sister. But after much determination on Allison's part, the two sisters finally meet and it is this that brings Brynn's world crashing down all over again. Claire is owner of Bookends, the small town bookstore in which Allison finds herself a job... Except she finds a lot more there than just a job. Claire is lovely; wife, mother and small business owner, she has had her fair share of trials and tribulations, but she feels settled now. Claire has all she ever wanted, but is Allison about to take all that away with a long held secret? And lastly we have Charm, a nurse in training who is taking care of her sick stepfather, Gus, but who also has a personal interest in the Kelby family - Claire, her husband Jonathan and their young son, Joshua. I love the plot of These Things Hidden, and the way in which these four lives are entwined, cleverly so. Without saying too much, I also liked how at the start of the book as a reader we were being lead to believe one thing only to be taken down another path. With a lot of contemporary mystery reads, it's hard to talk about the plot because they are best experienced first hand - although the same could be said for any book - but the unfolding story in These Things Hidden is so emotive and very much the kind of book in which you connect with the characters resulting in hard pulls on your heart strings. In particular for me, as someone who was at the bedside of a relative when they passed away from cancer last year, the scenes in which we see Charm's stepfather deteriorate and ultimately pass away as the result of cancer were just heart breaking - the realness of those scenes just really got me. With his raspy breaths being likened to that of a teapot and so much more, the narrative and it's observations were powerfully written. Perhaps they wouldn't have the same affect on everyone... I'm sure my own personal experience lends to those particular parts sticking out in my mind. Sticking with the narrative, I did just want to mention why These Things Hidden received four stars, instead of five, from me given that I did enjoy it so much. My one and only gripe with the book is how Allison and Brynn's narratives were told from a first person perspective while Claire and Charm's were not, they were written from a third person perspective. This didn't dampen my reading experience, or get in the way of following the story, I just didn't really understand why it was that way. Despite that, I'd still highly recommend checking out These Things Hidden by Heather Gudenkauf, or just her work in general. This is the second book I've read by her, the first being One Breath Away, and both stories were well crafted, capturing my attention and entirely enveloping me in the lives of the characters. This is an author I've been wanting to try and this sounds like a good read. It's definitely odd about the 3rd person narrative from half the characters. I think that might take some getting used too but everything else sounds really good. I can see how the scenes with Charm's stepfather would be incredibly powerful if you have real life experience with a similar situation. Great review! I'm adding this to my TBR! Surprisingly the switch between 1st and 3rd person narrative wasn't that hard to get used to... I just didn't really get why. The story still flowed well. You have to pick up a Heather Gudenkauf book at some point, honestly, so great! Also, of the two books of hers I've read, this is my favourite so a good choice to add to TBR. I'm glad you enjoyed this one - great review! Loved it!! 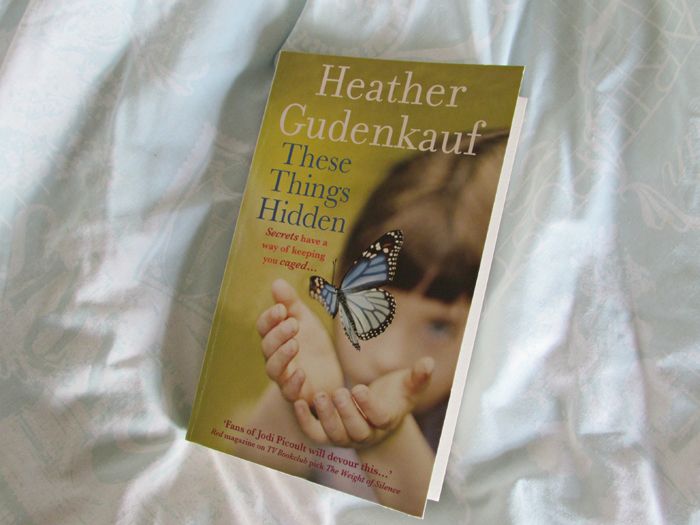 I've only read two by Heather Gudenkauf now but this is my favourite of the two. Thank you!